Nathalie is not only offering the $25 gift certificate but she's also offering 20% off for any D&OC readers! All you have to do is use this code at checkout: "DAOC20OFF". This coupon is valid until the end of December! Did you know that it's Thanksgiving weekend in Canada? Nathalie would like to offer a special Thanksgiving discount on all items in the shop for 30% off (including sale items) for the duration of the giveaway! Simply enter "DAOC30OFF". Happy Thanksgiving Canada! 1) Visit Canadian Rockies Art on Artfire here and tell me what you think. Do you have a favorite piece? 2) If you're a follower/reader/member of Down and Out Chic just leave a SEPARATE comment saying "I'm a reader!" 3) Sign up for Canadian Rockies Art newletter to get all the latest info on this lovely jewelery here and let me know that you did. Good luck! Winner will be pick next Tuesday night, 10/13/09. Wow! I love her jewelry. Simple, elegant and sweet. Happy Thanksgiving Nathalie! So hard to pick a favorite, her work is all beautiful. My fave is Tatissa - Large Picture Jasper Fine Silver and Sterling Silver Rustic Necklace Pendant. I'm a follower of D&OC. And I've subscribed to the Canadian Rockies Art newsletter. Happy Friday! She has the most beautiful handmade jewelry I have seen in a long time. I love everything but if I had to pick a favorite piece it would be the set of three stacking rings (the thin ones) they seem so delicate and perfect. I'm a follower of Down & Out Chic. Love this blog! I just signed up for Nathalie's newsletter! I love this jewelry! it perfectly combines a rustic feel with elegance...truly gorgeous. I agree with you...so hard to choose, but my three favorites are the Teyla Turquoise Ring, the Rustic Fused Silver Hoops, and I "love" the Love/Amore Garnet Heart Pendant Necklace! Just beautiful! ...and I signed up for her newsletter! Hope you have a wonderful weekend! stacking rings or bands please! Oh my goodness! Picking a favorite was so hard. but the first piece I saw that I loved was the Zabel - Blue Turquoise Oxidized Tear Drop Sterling Silver Hoop Dangle Earrings. OMG I can't even start to pick which earrings I love the most! Love them all! And 30% off she rocks!!!! Happy thanksgiving canada! I'm a total google subscriber :) Gotta make sure I don't miss any posts! My favorite piece is the stacking rings (set of 3) in sterling silver! Lovely! I love the Zabel - Blue Turquoise Oxidized Tear Drop Sterling Silver Hoop Dangle Earrings. It looks chic and fashionable! I signed up for Canadian Rockies Art newletter. I also subscribed to her newsletter! Love the stud earrings! Very dainty and beautiful. I absolutely LOVE her stuff, I think I could wear any of her pieces...& I'm not usually one to wear jewelery much. My favorite would be the Waverly necklace because I'm in love with all things paisley! A more budget friendly piece for me right now would be the adorable Zodiac necklace. nice find - she has a lot of stuff i'd give as presents, too! all the ones i love have great names; the mystical automn brooch, the paris in the park bracelet or the forged angels earrings. I Love the turquoise pieces and the stackable rings. I also joined the newsletter, I love her stuff! Oh and I am a follower :) Follow your twitter too! I LOVE the Iziel Solo - Interchangeable Sterling Silver Earrings (20 gauge). I'm really into the single-piece earrings, so simple and delightful! I really like the Hoop Charms - Aqua Chalcedony Large Smooth Briolette with Sterling Silver. Beautiful! I love the studs, especially the "little rocks"! Can I take one of everything? no? ok - I love the copper bracelets above. OR any of the hoops in the shop. and I signed up for the newsletter. And I looooooove the "May Stars Always Guide You" cuff.... truly love it!!! Crossing my fingers! I love all the Zabel earrings! The Siriann pendant is amazing! Oh, her things are so beautiful! 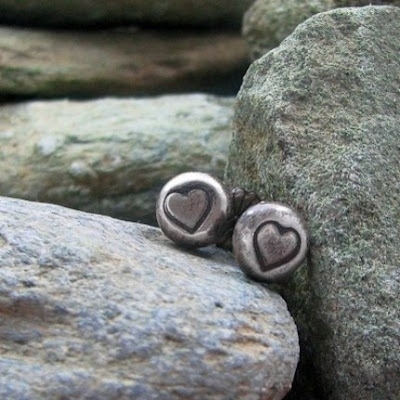 I would buy those Rustic Hearts stud earrings, they are so quaint and lovely. 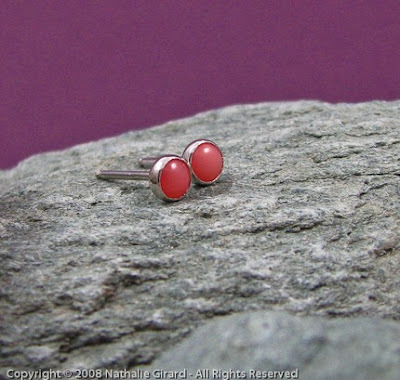 Red Coral double sterling silver ring! I got it down before I forgot!! Lovely work she does!! I love all of Nathalie's jewelry! It's beautiful! You can tell she puts her heart into what she makes. My favorite is her "Mystical Automn" Brooch! I am already a follower of hers, I get her newsletters and always look forward to reading them. I'm following your blog now! Following as Sihui. I like the copper bangles. I like Zabel Hoop Dangle Earrings. I love those bangles. The handmade/natural feel of the jewelry is really nice. I like the Anora - Sterling Silver Chainmaille Flower Pendant Necklace. I love chainmaille. I love her Artfire shop, it has such a rustic feel in her picturs,each is a grey rock, the pieces are all great, I have trouble picking a fave, I just want them all. I signed up for your news letter! Oooh, I think my favorite is the love necklace!! i love the stackable rings. i lost the ones i had this summer and have been looking to replace them. really wonderful stuff... very rustic. nice stuff. i'm curious how her Nylla pearl earrings look when worn. they look interesting lying on the rocks. and i just subcribed to CRA's newsletter! I had a LOT of favorites! I especially love the Hoop Charms - Aqua Chalcedony Large Smooth Briolette with Sterling Silver! So beautiful! I love it - So pretty!!! It's my fav! I signed up for your newletter. I could close my eyes and point to a favorite...ALL of them. This piece really caught my eye for Fall. The lampwork bead really does look like there are falling leaves inside. I follow this here blog. 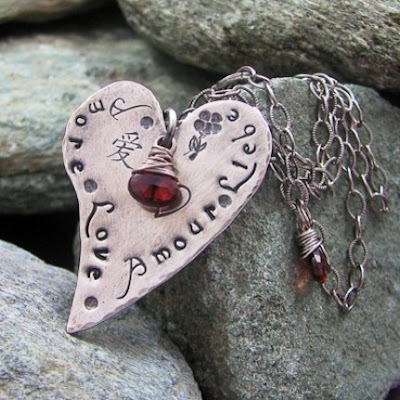 I love the amor amour love liebe necklace! It means a lot. Follower of your lovely blog. I love these Rustic Angels with Swarovski Pearls - Artisan Forged Sterling Silver Earrings!!! I am subscribe to your email and it was confirmed. It's SO tough to pick a favorite...this beautiful work is just so unique! I just love the Tatissa - Large Picture Jasper Fine Silver and Sterling Silver Rustic Necklace Pendant. I am following your blog (username Nelsby). I signed up for Canadian Rockies Art newsletter. I can't choose just one!!! My favorites are probably some of the items on clearance, although I'm thinking I really must have the blue starfish necklace! EEeee I don't think that I could choose! I also adore the fact that her pieces are made out of sterling silver; I'm allergic to a lot of metals. :0) The jewelry is very organic. I love Nathalie's jewelry! All of it! I'm a huge fan of Nathalie's jewelry and am a proud owner of some of her creations. I've already signed up for her newsletter. Another great giveaway Chris, how do you manage to always surprise us with a fantastic giveaway??? I basically like EVERYTHING, since I like this style very much and it is the one I would go for a treat to myself but probably my favourite is "Love Amour Amore Liebe with Chinese symbol Sterling Pendant", it is soooo pretty! I'm a follower of course! How do you pick just one? There are SO many great pieces on her site! I love the turqoise pieces and the Autumn pendant and the interchangeable earrings! I love all of the jewelry! 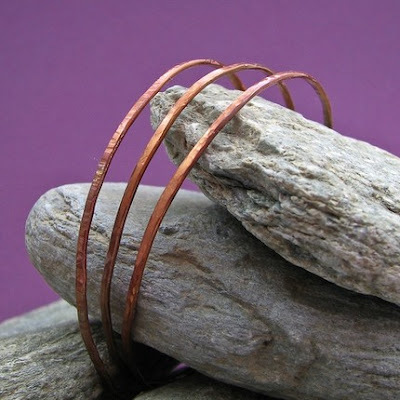 I really like the silver stack rings and the set of 3 copper bangles. So pretty! I recently discovered Down and Out Chic and became a reader! Love the jewelry....I think the Yariel Turquoise and Silver dangle earrings are my favorite! I love the Yariel Blue Turquoise earrings too! They're just gorgeous and so much fun. I really love the S Rustic Angels with Swarovski Pearls - Artisan Forged Sterling Silver Earrings. I like the rings most, and I love the Teyla.